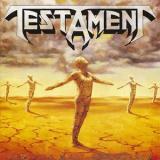 Out of Testament’s classic 80s material, my favourite has always been the technically masterful Practice What You Preach. The youthful, thrashing passion from The Legacy and The New Order were met with refined chops and a killer production job to create one awesome concoction of melodic metal with an into-the-pit-attitude. The title track starts the mayhem with wrist-crunching riffing that takes the piss out of mere air guitarists, let alone actual ones. Chuck Billy shouts and snarls with frightening power as Petersen and Skolnick punish those guitars like they were peasants getting their hands on French royalty at the end of the 18th century. The solos of Skolnick are especially grabbing and melodic, as his stronghold on varied styles, like jazz, comes out to shine. Greg Christian is immovable as the bassy foundation and although Louie Clemente was never one of the flashiest or grooviest of metal drummers, there is nothing missing in the frantic thrash beats and tasteful double bass flurries. The remaining nine tunes are marvellous as well, with variety to spare. You want it slower with a bit more meditative grinder? Put on Envy Life or Greenhouse Effect (possibly my favourite along with the title track). Catchy choruses to bang your fist to? Time Is Coming is for you. Quick beatdowns for the swinging heads? Blessed In Contempt and Nightmare should do the trick for you with ease. Despite the very corny name, The Ballad serves all your tear-jerking needs, provided you like your ballads fast and heavy after some deceiving withholding. Confusion Fusion is very good for a thrashy instrumental, staying mostly content in blasting out great riffs instead of an all out widdle-fest. If you dig melodic yet aggressive metal, Testament’s Practice What You Preach is definitely for you. I can’t find a weak song in the bunch and the balance between primitive rage and technical accomplishments is just about perfect. For those looking into Testament's for the first time, I think either of the first two records would be a better starting point, but this is where the thashiness of their 80s material peaked. After this one, the flavours of traditional metal became more apparent with Souls Of Black and The Ritual. As great as they are too, for me, this is still young Testament at its finest.